Whether a woman should move from one apartment to another? A woman with special requirements reqarding 'quietness' wondered whether she would more happy if she moved from her existing apartment to another one in a block near by. She has troubles with loud noises, the banging of doors, television sets next door, etc. Maybe the other apartment is more ideally situated? A real estate agent is enthusiastic to get her to go through with the deal under the assumption that this might solve her problem. He has said he can manage both trades and offer her a good price. The question is asked at 19.23 CST, 27 January 2010, Asker, Norway 59N50 10E26. 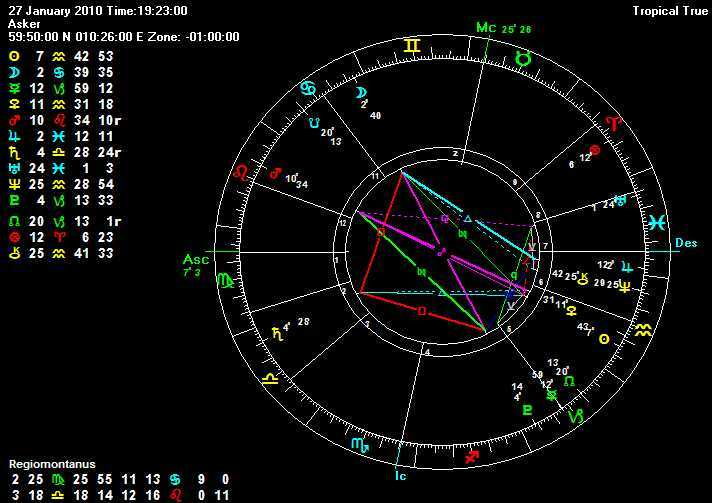 The question is asked on the Day and in the hour of Mercury with a Virgo ascendant, which proves the chart radical. I have often seen how this type of radicality offers protection to the querent or matter enquired upon, however, the question is often back to front in its design or phrasing. The question may reflect a state of worry or question regarding saftety, but it is as if the planet (lord of hour & asc) turns in and returns to itself and is thus protected. These are important matters to think about a the beginning of judgement. The querent is represented by the Virgo ascendant and its lord, Mercury, who is in Capricorn and on the cusp of the succeedent 5th house. Mercury separates from the square of Fortuna (nocturnal) in the Aries 8th. The 4th house is for her present location and the 7th house is for the place to where she may move. The 4th house is ruled by Mars, who is retrograde yet fixed, in a fiery sign and in the 11th house. The 7th house has Pisces on the cusp, which may indicate a place of a certain remoteness, but which also is a sign of many odds and ends. I considered the latter possibility, seeing that Uranus was in the same sign. Jupiter, lord of the 7th, is also in Pisces, this being his own domicile, yet he is cadent in the 6th. I could see no application or reception between the lord of the 1st and lord of the 7th house. The Moon is co-significator in the question and separates from the trine of Jupiter, lord of the 7th house. Luna's next application is to the opposition of Pluto and to the square of Saturn. I noted that the fixed star Algol on the Midheavan, which could signify someone loosing their head or the transaction getting into knots due to circumstances beyond the querent's control. Saturn was in the 2nd house, so I feared there may be some unduly expenses - and although she moves away from the disturbances in her present location, there is due to be new trouble up ahead. I could not see how I could applaud a chart with the Moon moving into a T-square with Saturn and Pluto. The odds are that this particular deal would not live up to her expectations and prove more trouble and bother than it was worth. I therefore advised the woman to stay put for the time being and wait for a more suitable occasion. The client said that the block in question had the same management as the one she was presently living in and this one one the issues she was not entirely pleased with. Her initial enthusiasm for the idea had cooled off and since the broker only was giving her a day to make up her mind, she decided to recline from further negociations. Okay so the querent is looking for somewhere quiet, what's preferable would be the significator for the new apartment to move into a mute sign. The IC is currently in the latter degrees of Scorpio, about to move into Sag. I'm taking that to be that either the IC is representative of the new apartment, or that the IC is the current apartment and about to move to Sag shows the new apartment. If the former the new aprtment is currently in a mute sign, great stuff, however its lord is retrograde through leo probably showing that the new apartment isn't top notch. In this scenario something will change (perhaps new neighbours) and the new apartment moves from being in a mute sign, Scorpio, to being in a loud sign - Sag. Also the reception isn't ideal there between Lord 1 and Sag. If the latter, she's currently in a mute apartment, scorpio, which, although not a great apartment (lord 4 is retrograde etc) it is still quieter than were she to move to this new apartment, which is in better condition (jupiter domicile etc) but is in a loud sign. Andrew I quoted your delineation yesterday, but my post disappeared. Saturn is opposing my Sun, and I have been living problems of being not seen. It seems that Saturn put a dark jacket on my Sun. [quote="Andrew Bevan"]Whether a woman should move from one apartment to another?